If you decide to move on from the Arduino, this is the next logical step – AVR Programming. In these two videos I hope that I can get you started in developing single chip solutions for the AVR ATmega328. At the end of the page I give you a video link to the setup that I use for my Arduino on a Breadboard video – this should be very similar to the type of setup that you need for a standalone AVR solution. This tutorial introduces the AVR Dragon. It is a device that allows us to program and debug AVR ATmega Microcontrollers. I show how to setup and use the AVR Dragon, soldering a 40 pin ZIF socket to the board and show how to connect it to AVR Studio 5 beta 2. I write a sample application and program it on an ATmega328. In this video I demonstrate how to write a small application using AVR Studio 4 and avr-gcc. It is an introduction for those new to the AVR platform. I am using the AVR Dragon as my program/debug tool and this tutorial demonstrates how to upload and debug code using this device. This tutorial shows you how to build an Arduino on a breadboard. It describes the use of 16MHz and 20Mhz crystals for driving the Arduino and compares their use to the use of a resonator. A simple circuit is created that blinks an LED for 1000ms and 100ms. The Arduino is programmed on the breadboard using an Arduino shield’s Reset, TX and RX pins. Just revisted these AVR-related videos after a year or so–great stuff! 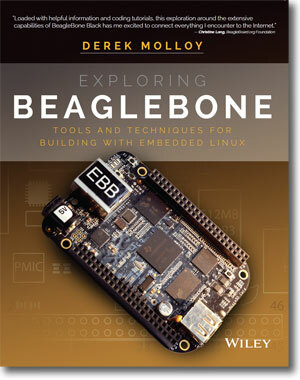 I’m working on the Beaglebone/BBB stuff and Qt, but I’ll need to do some work with the Arduino (or straight AVR) hardware as well…so I thought I would do some review. How do you find the Arduino libraries to be Derek? I actually like them quite a bit as they make development very slick. But I’ve been reading a fair amount of criticism (mostly from die-hard AVR folks, is my guess) on how they spoon-feed things to you too much. I’ve also read that the libraries were quite buggy–especially prior to Arduino 1.0.0. But I think they’ve been improving as far as I can tell, and I really don’t have a burning desire to reinvent the wheel each time I need to talk to an I2C sensor, or write to an SD card over an SPI. Do you think there’s any commercial development projects using the Arduino libraries yet, or are they pretty much for hobbyists, academic types and hackers? Thanks for all the work you do on this stuff!